Hutton's Vireo by Birds and Friends. I follow a lot of talented artists on Instagram and many of them are illustrators of such subjects as, you guessed it, birds. I'm delighted by the number of artists out there, many of them women, who are passionate about wild birds and featuring birds prominently as subjects. Many of these artists also include photos of themselves field sketching or birding. My people! Would the world be smaller please so I can meet and support these awesome gals? This week I made a connection with one such artist when I decided I needed a favicon of my own. I turned to Instagram for ideas, and to consider who I might approach to design one. I wanted something fun and simple, not too representational, and neutral in color while I figure out the rest of the intent of my website. And I wanted a Vireo. My son's name is Vireo, and these birds are found throughout the US, and while not rare, they are uncommon enough to be special when seen. We have Hutton's Vireos where I live in the Pacific Northwest, and their plumage is just what I had in mind for simplicity and elegance. The result is this sweet image above, by Wen Rockoff of Birds and Friends. I messaged her through Instagram about my interest and asked her rate, and three days later, this bird appeared in my inbox! Gawd, I love the internet. Wen is a young artist developing an illustrated cache of feeder birds of North America and turning them into a collection of regional guides. The first such guide can be found on her store here. She consults Project Feeder Watch at Cornell's All About Birds for her selection, and I cannot wait until her feeder birds of the Northwest region comes out! So you might be reading the title of this post and be thinking, "Greenwich Village? What's an ecologist going to do there?" Turns out, a lot. Georgia Silvera Seamans has been on my radar for a couple of years via her thoughtful and meticulously researched blog the local ecologist, where she writes about her life as a nature lover in New York City. 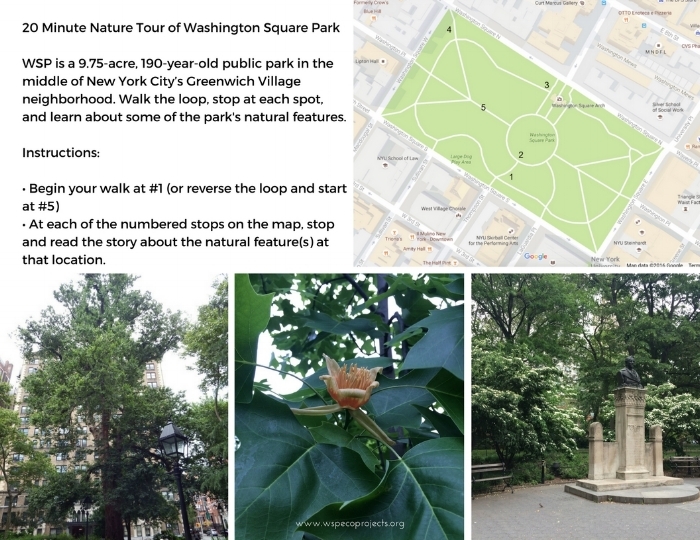 Specifically, she writes about her neighborhood park, the iconic Washington Square Park (WSP), and the goings on of the flora and fauna that live within it. So besotted was she with the park that she co-founded WSP Eco Projects , a non-profit with the purpose of educating visitors about the natural history of this very urban open space. Georgia comes to this role with some heft: She's an urban forestry consultant with a PhD in landscape architecture and environmental planning from University of California, Berkeley and a Masters in environmental management from the Yale School of Forestry and Environmental Studies. Her 15 year career covers trees, the life those trees support, and the urban settings where those trees cohabit with people. As an urban gal myself, the stories Georgia tells ring familiar to me: we both seek and revere nature in place, and want to share it with our fellow city-dwellers. In her blog and through WSP Eco Projects, Georgia brings an intimately-focused study to life for visitors to the park. She peels away the layers of city sheen to share everything from insects to fungus to leaves and root patterns, all found in her park around the corner. And more recently, she's focused on the birds of the park. In WSP's modest 9.75 acres, Georgia and her colleagues have recorded a whopping 57 bird species since starting the census in 2016 (and according to eBird records, 87 species have been seen). Such dedication to a small urban park as an educator and advocate really impresses me. I wanted to learn more about Georgia and her projects so invited her for an interview here. How did you develop a passion for trees and the life trees support? Georgia Silvera Seamans: I was born in Jamaica and lived there until I was 13. In growing up, we had fruit trees and played in them and ate from them. The development where we lived was converted from sugarcane, and there were undeveloped lots where we could explore. Jamaica is a good mix of landscape types--coastline, then more dense vegetation inland. I thought everyone had access to this kind of environment. When we moved to the US I realized not everyone can walk outside and pick fruit! Later my passion for trees solidified in grad school, when I was studying environmental law and policy. My classes had an urban focus, being in New Haven, and after graduating I served as a forestry intern for the city. That set me on this path of urban forestry focus. Who supported your interest in trees and urban forestry? Who are your role models? Do you encounter many other people of color in your field? GSS: My mom has always had a green thumb and interest in plants. I'm drawn to people and plants; it's a non-discriminatory area of activity. I had mentors at Yale, as well as within the portfolio of community groups I worked with as part of my graduate studies. All of these groups were led by black women and many people of color volunteers, many of them older people, dedicated to thriving green spaces in an urban setting. There was not a lot of domestic diversity in my graduate program at Yale, though there was international diversity. Yale recognizes this and is trying to remedy the lack of diversity. But it may be a reflection of the New England location. For instance I know there are many students of color studying forestry in the South (of the US). Urban forestry is a component of social justice and much of that work is being done by people of color. Issues like storm water and air pollution impact those living in the city. I think about the professional pipeline and getting kids of color to think about urban forestry as a viable profession. It's easier to engage a young person if that person looks like them. But I do not feel like a trailblazer. There are many people doing this work already, and people like Wangari Maathai in Kenya; they are my role models. Washington Square Park in early spring. Photo by Georgia Silvera Seamans. What led you to found WSP Eco Projects? GSS: I live very close to the park and wanted to share information about its trees with other visitors. Four years ago another park enthusiast Cathryn Swan and I combined forces and applied for a grant through In Our Back Yard to create a Tree Map of Washington Square Park. Casey Brown was the developer of the map, and its creation inspired me to design more educational programming around the park. WSP Eco Projects is the name of this offshoot idea; I wanted the name to be nimble enough to allow a variety of things for and of the park. We are not a formal 501(c)(3) but I hope to be one day. We're permitted by the City of New York, which allows us to lead walks and other programming, and we follow research protocols for any data we collect in the park. These things give us legitimacy and makes our data valid and something we can offer to scientists. We're all volunteer run and those leading walks or projects donate their time and expertise. We have a core group of us and want to grow, but it's NYC and people are really busy! Our model is more intermittent participation, asking people for a once a year donation of time. For instance, Heather Wolf of The Birds of Brooklyn Bridge led a few walks for us and has indicated an interest in working together again. We take advantage of things that come our way and try to offer plant and bird walks seasonally. Interpretive hand out developed by the WSP Eco project for a tour of the park's trees. Courtesy of WSP Eco Project. The flip side of the interpretive hand out. I've noticed you are writing a lot more about birds in the park; that's something that clearly resonates with me as an urban bird advocate. GSS: My mentor for birding is Loyan Beausoleil, who is responsible for the success of the bird survey of the park, which was started in August 2016. We count birds as part of a larger vertebrate survey including squirrels and rodents. We conduct the survey under the auspices of a permit issues by the NYC Parks Natural Resources Group. We record species and number of individuals observed along a roughly 1/2 mile transect. Eco Projects has observed 57 species between 2016 and present using this transect model. The most unusual bird we’ve seen since the survey began was a Kentucky Warbler in May 2017. In addition to the survey, Loyan and I bird separately in the park. Lately there have been Wood Thrush, Swainson’s Thrush, Hermit Thrush, Ovenbird, Gray Catbird, Common Yellowthroat, Black-and-white Warbler, a Scarlet Tanager, and today, I saw an American Redstart. A birder in the park recorded a Chestnut-sided Warbler over the weekend. Finally, there are three eyases in the redtails’ nest this year. The nest has been in the same location since 2011, on a 12th floor window ledge of the NYU Bobst Library. As a result of our survey, we wanted to bring bird education materials to WSP in the spring and summer. We partnered with the Uni Project to create a pop-up learning environment within the park, and with them applied for a Blake-Nuttall grant (which supports bird-related projects in New England). The collaboration is called EXPLORE Birds, and is a simple intro to any bird you will see in New York City. Now, we have skins and books about birds, and the collection is growing as we speak. I applied for federal and state permits to possess bird biofacts for educational purposes for WSP Ec-Projects. Loyan and I are learning how to prepare skins at the American Museum of Natural History. All the birds are window or car strikes. We have two kestrels, a northern flicker, red-tailed hawk, pigeon, and starling skins. We've now taken Explore Birds to other neighborhoods. 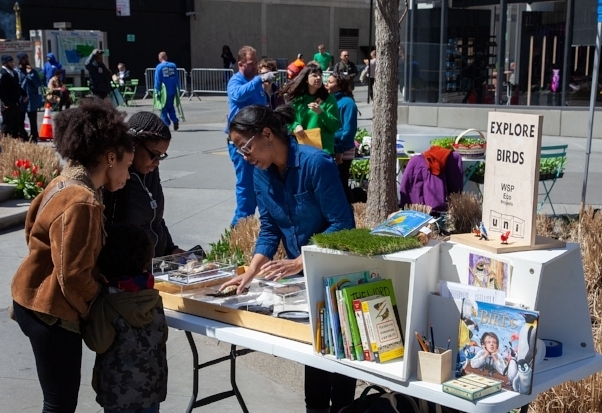 We participated in April Earth day block party in Brooklyn, and I was blown away by the enthusiasm we got. Especially the children, who were like bees to honey over the bird skins. They were delighted by the display, and to learn that the skins (starlings) they were handling had live counterparts in the plaza. It was three hours of nonstop interest at our table. It's not until it's pointed out, sometimes, that people see and hear what's always been there. GSS: The way that people interact with their environment, not all people are at the same place you are on the spectrum. And that is sometimes where outreach fails. Hearing people's story, everyone has a story about birds. The way we talk about science is different for every community. People use different language to talk about the same things, and may know as much as you do when talking to your peers. Georgia at an Earth Day event in Brooklyn, April 2018 at the EXPLORE Birds booth. EXPLORE Birds is a partnership between Eco Projects and the Uni Project. Photo credit: The Uni Project. A close up of the bird skins at the booth. Photo credit: The Uni Project. Have you explored "true" wild spaces around the world, larger intact ecosystems? Where? GSS: I smiled broadly when I read this question. I know what you mean by this question but in my work with Eco Projects I try very hard to convince people of the wild/wildness in the park. I’ve spent time in capital N nature. When I lived in California we hiked and camped in Yosemite and Kings Canyon. We visited Point Reyes National Seashore and the wide open spaces in wine country. After college, I volunteered with Ameri Corps and spent time in big landscapes Oregon and in Idaho. In college, I studied abroad in Botswana and as part of that experience, we spent a lot of time in the bush with some of the most well-known charismatic mega fauna. What about cities outside the US? What is your observation of urban forestry outside the US? GSS: Interesting that you should ask this question. I am not very familiar with urban forestry outside the US but I was talking with a friend recently about tree planting in cities. She’s from Russia and she has observed that NYC and US cities in general don’t have a lot of trees. There are not the tree-lined streets or boulevards that she’s used to. In addition to Russia, she’s lived in Germany and Japan and she’s noted that the green spaces in those countries are more heavily treed and more numerous and accessible. In addition to the anecdote from my neighbor I would say that there are a few things happening in abroad in Europe that I've been following that maybe not explicitly urban forestry fall into broader study of urban ecology. 2 - Expanding the traditional conception of ecosystem services has shone a light on the relationship between health and urban green space. Health is hot spot in the conversation and research about the benefits of urban green spaces. Access to green space is implicated in cognitive, behavioral and general mental health outcomes across age groups. Florence Williams in her book The Nature Fix profiles several international programs designed to take advantage of nature's wellness benefits. In the U.S. Dr. Frances Kuo has an excellent portfolio of research on the benefits for children who have access to green space. Check out her lab: http://lhhl.illinois.edu/about.htm. More recently, Dr. Robert Zarr designed and launched the Park Rx program in DC. I heard him speak at a meeting of the Sustainable Urban Forest Council. 3 - Elevating the status of spontaneous vegetation. A lot of this work is being done by artists, designers. It's also happening here in the U.S. too. My research on US and European artists/designers was published recently. I think this is linked to conversation about what vegetation will thrive in climate-changed cities and regions. What about YOU and your professional goals--where do you see yourself in 10 years? GSS: I see myself still engaged with Eco Projects. This is a passion project for me but it’s also something that I would like to continue to professionalize. I would like to operationalize the model so that other parks can use the framework for education, advocacy, and research. My early professional background is in urban and community forestry. Over the last couple of years I’ve gotten into birding and would imagine that I would have progressed in bird ID and biology in 10 years. I’d also like to be gainfully employed as a writer, telling stories about people and their relationships to the nature of cities. The group at WSP for the 2018 Great Backyard Bird Count in February. Georgia is second from left. Photo by Heather Wolf of The Birds of Brooklyn Bridge. This interview was conducted over the phone and by email in April, 2018. Some portions have been edited and condensed for clarity. My daughter and I on a nearby beach (not in Othello). 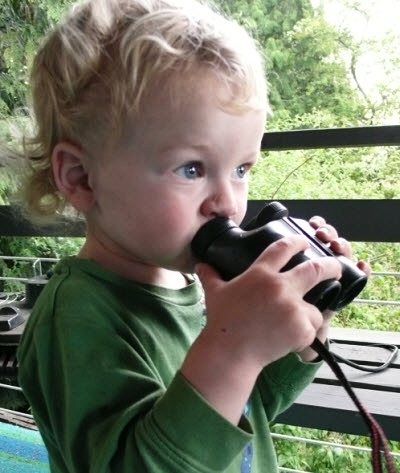 Birding with children? Why not start them young? 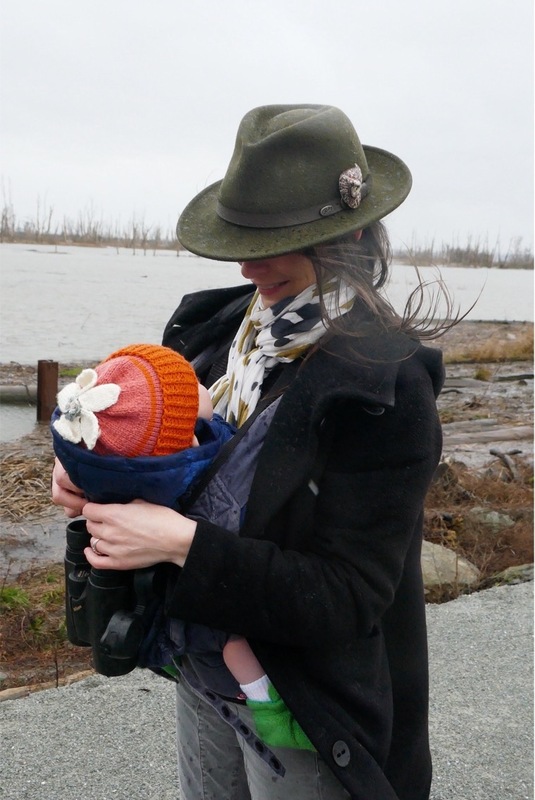 As a gal who birds where ever I am, that means I'm birding with my children in tow, whether it's just running errands or standing on our porch or out birding someplace special--birding is simply built into our lives. My daughter is still portable and obliging of anywhere I take her, but my son sometimes objects to my birdie-ness. So I have developed systems for making it fun for him, and any other kids who join in. Last weekend my sister and I took our kids to the eastern part of our state to see migrating Lesser Sandhill Cranes numbering in flocks of thousands, and the trip showcased all the fun and novel things I like to include when taking children on a birding excursion to ensure they come away loving the experience. Those Lesser Sandhill Cranes number in the thousands. This emphasis on volume is hugely impressive to kids, and easy for you--the birds are there for all to see and very little effort is required to see them. Some online research to a birding festival or local Audubon or nature center should lead you to some notable bird hots spots in your region. We joined the annual Crane festival in Othello, WA, which organized the bus tour from which this below photo was snapped as the cranes flew overhead to their roost. Lesser Sandhill Cranes flying in at dusk to their night roost at the Kooteney Reservoir outside of Othello, WA. The Othello Sandhill Crane festival invites agencies and organizations from across the state to set up displays and tables, and every year the Raptor Club from Washington State University's school of Veterinary Medicine come with their captive, rehabbed birds. The bird handlers are all club members, most of them science or vet students at WSU. We were allowed close proximity (but absolutely no touching, for the safety of human and bird) for observing each other. I LOVE getting close to a wild bird that is accustomed to captivity, as it's a chance to observe in detail the glory of a bird's plumage and movement. Let me say I would never approach this close to a bird in the wild as my encroachment puts them at risk of greater than normal stress and distraction from foraging and from predation. Proximity like this is valuable for children in understanding the vitality of other creatures, which is sometimes more of an idea than a reality when we are mostly watching birds from afar. Children may have a low tolerance for a single activity (Imagine that! ), so we mixed in two hikes during the day, and let the boys throw a few rocks where it was safe to do so, as well as point out any birds we saw. We plied the boys with chocolate through the less exciting parts of the route, and once we reached the highest ridge, the kids took one look at the big sky view and got a hurricane-like second wind. I have to remember that enthusiasm ebbs and flows with children, and the whining is worth the eventual thrilled squeals when they see the 50-foot high gravel pile and tear off toward it. Especially when from the top of that gravel pile they see cranes flying overhead so low it seems they could reach up and graze a feathered underside. My son (in the foreground) and his pal at the Columbia National Wildlife Refuge outside of Othello, WA. From this spot we heard, then saw Lesser Sandhill Cranes circling high above us. Gotta love rednecks. They leave all kinds of things behind; old couches, toilets, beer bottles and shell casings. My son was pleased beyond his wildest dreams to find the landscape of the Potholes Natural area outside of Moses lake strewn with shell casings of every color of the rainbow. What I find as destructive trash my son saw as collectible treasure. As I huddled in the wind trying to orient my binoculars to the scant birdsong audible in the wind, he ran around collecting as many casings as he could pocket. My sister Gilia and my son at the Potholes Nature preserve outside Moses Lake, WA. Shell casings and tumbleweeds added to the interest of the area. Shell casings in every color! My son collected pockets full. Thankfully, the kid loves rocks, shells and petrified wood as much as those casings, and the next day he got his fill of more natural treasures when we visited Frenchman's Coulee area along the Columbia River. Which leads to the next suggestion in birding with kids. The rock climbing scene at Frenchman;s Coulee outside George, WA. The rock climbing scene at Frenchman's Coulee is the stuff of fit hipster dreams--colorful tents dot the area to the side of the parking lot, tens of 20 and 30 somethings quietly press themselves into the rocks all around, and not a spot of garbage flutters in the warm spring wind. The children watched the climbers curiously for a while, then tried a bit of bouldering themselves, while sis and I scouted for Say's Phoebes. Say's Phoebe. Photo by Mike Hamilton. Communities where these birds live need to hear from those visiting that the birds are the reason for our stay and investment in the local economy. Many rural economies depend on tourist dollars, so it's important to spend your money locally, rather than bring provisions with you. The more you spend and chat with the shop owners about the bird festival (or casual birding visit), the more reason that community will consider birds and their conservation as a good thing. Demonstrating this to your kids will rub off on them eventually (I promise). They'll remember the visit as more than just passing through, but as contributing to the greater good. My sister and I have dedicated stamina for hitting the ground for the day, but the kids aren't there yet, not even close. Pushing them to bird, or at least, accommodate our birding while they are otherwise occupied in the same landscape, does come with limited duration. Over the weekend, we granted them ample time in the hotel pool, dinner at 4:30 pm, and plenty of time to sleep in. We hope that they'll like these trips, after all, and the last word when we got home was, "I want to do that next year!"